Queensborough Community College Student Impact Team member Alisha Traille. As a familiar fixture on many campuses, the Barnes & Noble College bookstore has become a well-known icon in academic retailing. In addition to being a valuable resource for student course material and textbooks, Barnes & Noble College continually reexamines opportunities to better assist the students and institutions it serves. An outcome of this process has resulted in a program empowering students with increased access to a college education under the Barnes & Noble Student Impact Team initiative. Designed to assist students who might otherwise be unable to financially support further education, the Barnes & Noble Student Impact program awards scholarship grants to incoming freshmen who have demonstrated a strong academic record in high school. Student Impact Team members receive not only the financial assistance necessary to attend college, but also have the opportunity to become part of an integral program benefiting students, their college and the communities they serve. QCC students, Alisha Traille and Jonathan Melendez share a smile with Thomas Garripa '64 and his wife, Joan Garripa at the Annual Donors Reception. 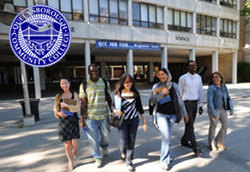 At Queensborough Community College, part of The City University of New York (CUNY) system, Student Impact Team members become actively involved in a variety of event and fundraising opportunities, often meeting the very contributors who may have helped make their education possible. Alisha Traille, a Merit Scholar and a nursing student at Queensborough, explains. “I was actually one of the first members of the Impact Team when it was introduced here at Queensborough, and it’s been a great opportunity to host events, network and talk about our life goals to college donors,” she says. Between representing Queensborough at fundraising events, Student Impact Team members have the opportunity to meet once a week to exchange experiences and learn about upcoming volunteer events. The Queensborough Community College program included an initial donation from Barnes & Noble as well as an additional annual donation that enables more students to access better educational opportunities. Together with Queensborough’s Edge for Success student program, the college can provide deserving students with that extra edge, enabling them to complete college and begin a rewarding career. In Alisha’s case, the program has certainly proved beneficial. Upon obtaining her Associate in Applied Science degree, she plans to continue her studies to earn her bachelor’s degree and become a nurse. The skills she has learned representing the college however, have also influenced Alisha in some of the decisions she may want to make in her later life. “I’ve found I really enjoy fundraising and speaking to the donors who contribute so much to our the school, so I would like to continue that with perhaps some kind of fundraising to support research into a specific disease – perhaps Cancer or Multiple Sclerosis,” she says. Visit bncnews.com every week for more news and updates.